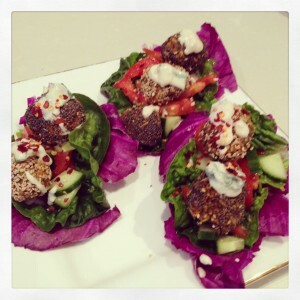 Raw Veggie Falafels – Gluten Free and Delicious! Wow, these look really fancy and difficult but they aren’t. These raw veggie falafels are like the savoury version of a bliss ball. They are handy to have in the fridge for a quick on-the-go snack, or served on a cabbage leaf with a side hit of salsa and tahini dressing. Combine all ingredients in a blender or food processor. With damp hands roll into balls and then roll into seeds to coat. If you have a dehydrator, you can place in there at 46°C for an hour, or on your lowest oven setting. Otherwise, place them uncovered in the fridge. The aim is to slightly dry them out. Serve with a salsa made from tomato, cucumber, red onion and avocado on top of a red cabbage leaf or cos lettuce leaf. Add extra coriander, lime wedges and a sprinkle of chilli flakes for some zing. To make a delicious tahini dressing: Shake 2 tbsp tahini, juice of half a lemon, 6tbsp water and some chopped mint in a closed container. Drizzle over the falafels to serve.